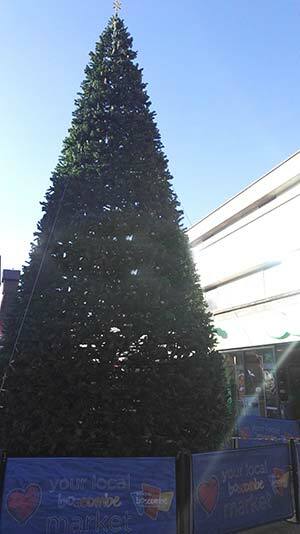 Boscombe’s business community has come together with the support of Bournemouth Coastal Business Improvement District (BID) to bring a ginormous Christmas tree to Boscombe town centre. Located in the precinct next to the genuine Hungarian Folklore Market, the dazzling artificial tree is set to wow visitors in the final run-up to the Christmas festivities. Measuring at an astounding 12 metres (40 ft) and holding six thousand twinkling lights, the tree is the largest Christmas tree to be found in Bournemouth.